For the second year in a row, Hilton has been recognised as one of India’s Best Companies to Work For, an accolade dedicated to companies with exceptional workplace cultures. Ranked 25th on the Top 100 list, Hilton has been distinguished for creating a high trust and high performance organizational culture by offering Team Members (employees) great environments, careers and rewards. "We are absolutely thrilled to be recognized as one of India’s Best Companies to Work For consistently for the second year running. As a business of people serving people, our Team Members truly are at the heart of our success,” said Brendan Toomey, vice president of human resources, Asia Pacific, Hilton. “I am extremely proud of our team in India and the incredible culture that we have built together which aligns with our commitment to be the most hospitable company in the world." This recognition follows a series of other recent accolades for being a great place to work. Hilton was ranked third in the Asia's Best Multinational Workplaces 2017 and Best Companies to Work For in Greater China 2017 by Great Place to Work. Last month, Universum also named Hilton as a top hospitality employer and one of Top 100 Most Attractive Employers for business students in China. · Five-day workweek policy, which is currently in place across the majority of hotels and corporate office in India. Plans are underway to implement this policy across India. · Travel with Purpose, Hilton’s corporate responsibility commitment enables Team Members to positively impact local environments and communities around the world through initiatives including Global Month of Service, Earth Week and Travel with Purpose Action Grants. To date, US$42,000 worth of Action Grants have supported 10 projects in India. · Celebrating diversity in the workplace through initiatives such as Women in Leadership events that have empowered more than 30 female Team Members in India since 2016, helping them in their career journeys. The ongoing effort underpins Hilton’s pledge to drive diversity across Asia Pacific as a Singapore IMPACT Champion in support of HeForShe, an UN-led gender equality movement. · Opportunities for development through programmes such as Hilton South East Asia & India Management Trainee Programme, which was introduced to India in 2015. So far, 20 graduates and trainees from India have had the opportunity to gain overseas work experiences in hotels across Asia Pacific. Other initiatives include Hilton University, a substantial online learning resource, as well as E3 (Elevate, Engage, Excel), a leadership development framework. · Go Hilton, a programme that provides exclusive travel discounts and benefits for Team Members, as well as their family and friends. · Opportunities for recognition through programmes such as Catch Me at My Best, and the CEO Light & Warmth Awards that acknowledge Team Members at all levels from guests, peers and managers, as well as Team Member Appreciation Week which saw over 100 events organized to celebrate Team Members in India. Every year, Great Place to Work collaborates with The Economic Times to identify India’s Best Companies to Work For. Over 600 organizations, spanning 20 industry sectors were assessed in 2017. The selection process includes an employee survey and an in-depth questionnaire about company practices and programmes. 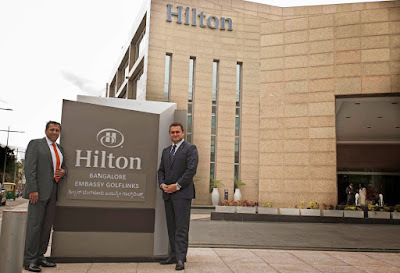 Hilton employs more than 2,500 people in India across its 15 trading hotels and corporate office. The company is creating thousands of new jobs in India through its pipeline of 18 new hotels, including the forthcoming Conrad Bangalore, which opens later this year.